Imagine that you are going to Brazil soon. You are talking on Skype with a Brazilian friend and want to ask how the weather is there today. This simple conversation is a great source of confusion among Portuguese learners. In this lesson you will learn relevant vocabulary and 16 common phrases that we use to talk about the weather. I will also show you a few mistakes that you should avoid. Below is a list of 16 common phrases to talk about the weather in Portuguese. Notice that all of them use the verb Estar. Therefore these are sentences you use when you are talking about how the weather is at the moment. Como está o tempo? = How is the weather? O tempo está bom. = The weather is good. Está ensolarado. = It’s sunny. Está sol. = It’s sunny. Está fazendo sol. = It’s sunny. Está quente. = It’s hot. Está calor. = It’s hot. Está fazendo calor. = It’s hot. O tempo está ruim. = The weather is bad. Está nublado. = It’s overcast. O tempo está fechado. = It’s overcast. Está chovendo. = It’s raining. Está nevando. = It’s snowing. Está ventando. = It’s windy. Está frio. = It’s cold. Está fazendo frio. = It’s cold. Não está frio. = It isn’t cold. All the sentences above that start with the verb Estar would start with “It” in English. Did you notice that? You will see that often in your Portuguese studies. One of the phrases above was: Está chovendo. Notice how the verb is spelled with an “o” and the noun with a “u”. You can sing along with Jorge Ben to keep this in mind. He has a song called Chove Chuva. Listen to the song and follow along with the lyrics here. In Portuguese, to snow = nevar. It is a regular verb. I love this one. The sentence above means “It’s windy”. Guess what? We have the verb ventar. So literally what the sentence above says is “It’s winding”, just like we say raining or snowing. The correct use of the words calor, quente, and frio with or without the preposition com is a source of great confusion among Portuguese speakers. I hope to clarify that for you here. Below are phrases that you should memorize. Be careful not to mix when to use and not to use the preposition com. It totally changes the meaning of the sentence. Estou com calor. = I’m feeling hot. Estou com frio. = I’m feeling cold. It completely changes what you are saying when you do not use the preposition com with the words quente and frio. A comida está quente. = The food is hot. O café está quente. = The coffee is hot. Está quente. = It is hot. Está calor. = It is hot. Use this one to talk about the weather only. It cannot be used to talk about your food or coffee. A comida está fria. = The food is cold. O café está frio. = The coffee is cold. Está frio. = It is cold. Why struggle with Portuguese? Practice with the pros. 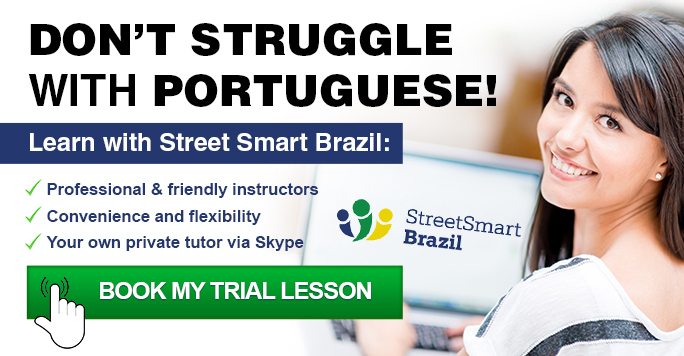 Book a Trial Lesson with the Street Smart Brazil team to speak Portuguese comfortably.